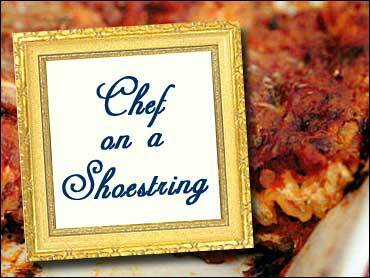 On the latest Chef on a Shoestring, The Saturday Early Show breathes new life into Thanksgiving leftovers -- Italian-style. We invited Chef Michael White, the executive chef at New York's Fiamma restaurant and Fiamma Trattoria in Las Vegas, to create a three-course gourmet meal for four on our budget of $30, plus some leftovers. His menu: an appetizer of Radicchio & Bibb Lettuce Salad with Cranberry-Balsamic Vinaigrette Served with Stuffin' Muffins; an entrée of Turkey Lasagna with Roast Vegetables, Gravy and Mashed Potatoes; and for dessert, Cranberry Mascarpone Parfait with Granola. White was named Esquire magazine's "Chef of the Year" and selected as one of New York City's "Best Chefs 2002" by New York magazine. The Wisconsin native lived and worked in Europe for many years before returning to the states. It was in France and Italy that he earned his stripes and fell in love with modern European cuisine. In his salad for the Chef on a Shoestring challenge, White used two different types of lettuce: radicchio and bibb lettuce. Radicchio is a red-leafed Italian chicory that is most often used as a salad green. Radicchio has tender but firm leaves with a slightly bitter flavor. Radicchio is available all year, with a peak season from mid-winter to early spring. Chef White selected bibb lettuce to contrast the slight bitter taste of radicchio with a slightly more "buttery" flavor that you get with bibb lettuce. He also used mascarpone (Pronouncer: mask-kar-POHN or mas-kahr-POH-nay) cheese for his dessert. Hailing from Italy's Lombardy region, mascarpone is a buttery-rich double-cream to triple-cream cheese made from cow's milk. It's ivory-colored, soft and delicate, and ranges in texture from that of a light clotted cream to that of room-temperature butter. It's versatile enough to be blended with other flavors and is sometimes sold sweetened with fruit. In Italy's Friuli region, a favorite blend is mascarpone mixed with anchovies, mustard and spices. Place chopped radicchio and bibb lettuce into a large bowl. Next, combine extra virgin olive oil, balsamic vinegar, cranberry sauce and Dijon mustard and whisk together. Salt and pepper to taste. Reserve on side. Lightly butter the muffin tins with the 1 tablespoon of butter. Place leftover stuffing into the lightly-buttered muffin tins. Bake at 350 degrees F for 25 to 30 minutes or until crispy on top. Using tongs, toss greens with vinaigrette together in the bowl. Divide the greens evenly among four salad plates. Spoon stuffin' muffin in center of each plate with greens spread around it. Garnish with toasted walnuts and orange segments. Serve. Place the walnuts on a baking sheet. Bake until the walnuts are lightly golden which will take about 7 minutes. Remove from oven and set aside. Second method for toasting walnuts: Place walnuts in a non-stick skillet. Using medium heat, toast the walnuts for about four minutes. Remove from heat and reserve. Chef's Note: This is Chef White's Italian version of shepherd's pie. You may use any vegetables you have leftover for this meal. You may use sweet potatoes in place of mashed potatoes if you have it. This dish is perfect to use your leftovers. Use the one tablespoon of unsalted butter, and butter a baking dish. Then use the 2 cups of stuffing to cover the entire bottom of the dish to create the base layer. Next, alternate layers of the sliced turkey (white and dark meat) and the roasted vegetables. As you layer, include little spoonfuls of gravy to make the dish juicy and flavorful. Salt and pepper to taste. Repeat these layers until you use up all of the ingredients (2 to 3 layers). Top the lasagna with a smooth layer of mashed potatoes. Bake for 45 minutes to 1 hour. Serve warm. Pre-heat oven to 375 degrees F. In a bowl combine the rough chopped vegetables. Toss with the oil. Season with salt and pepper. Place vegetables on a baking sheet. Place the butter on top of the vegetables. Roast uncovered for approximately 20 to 25 minutes. You want them tender, but not too browned. In the mixing bowl of a standing electric mixer, combine the mascarpone cheese, heavy cream, sugar and vanilla extract. Using the whip attachment, beat the ingredients together for 1-2 minutes. Reserve on side. In a tall highball glass, begin alternating layers of cranberry sauce, granola, and mascarpone mixture. Repeat this step until you have reached the rim of the glass. Finish with a dollop of mascarpone.